The Simple Moving Average (SMA) Slope identifies whether the intermediate trend of the market is up or down. It uses the 6 month SMA (180 day) of the chosen market index. It compares the current moving average to its value 1 week ago. If the 6 month SMA now is higher than it was 1 week ago, the indicator is bullish; if it is lower, bearish. Why it is a Bearcatcher: Using this simple timing signal by itself improves returns over buying and holding the S&P by about 25%, and decreases risk by about 60%. The above example shows a Bullish environment. 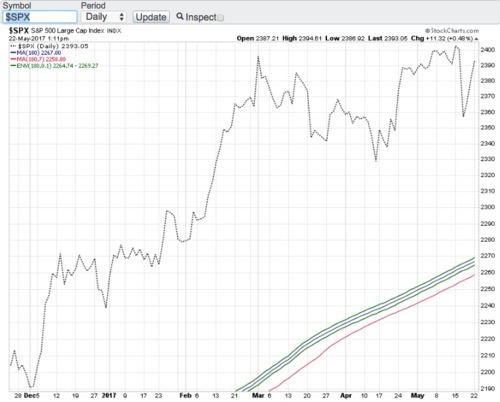 The blue line (the current SMA) is above the red line (the SMA one week ago). The green lines around the blue line show a .1% tolerance band ("hysteresis"). The author of this page uses that band to avoid whipsaws. In a neutral market environment, this signal can be noisy, switching between bullish and bearish; a tolerance band as shown reduces the number of signals to keep them meaningful. This is an intermediate-term trend, defensive signal. It keeps the user in the market during short term drawdowns, is a slow-moving signal, and only changes when the market conditions have changed in a meaningful way for a meaningful amount of time. As such it will also not catch "exact" market bottoms. The optimized SMA "lookback" was tested to be about 180 trading days.